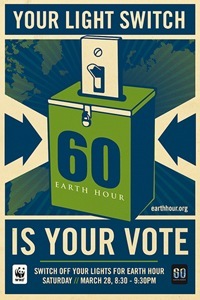 This year, Earth Hour is conducting the world’s first global election, between Earth and global warming. You can cast your vote with your light switch. “Vote Earth” is a global call to action for every individual, every business, and every community. A call to stand up and take control over the future of our planet. Over 2,712 cities, towns and municipalities in 83 countries have already pledged their support to VOTE EARTH during Earth Hour 2009, and this number is growing everyday. On Saturday March 28, wherever you live on planet earth, simply switch off lights at 2030 hours local time for 60 minutes and join the world for Earth Hour. Why to participate in Earth Hour 2009 ? Earth Hour 2009 is a truly global initiative to fight against climate change. Climate change threatens lives, livelihoods, and lifestyles. In fact, cities consume 75 per cent of the world’s energy and produce 80 per cent of its greenhouse gas emissions. That’s why it’s important for cities to work together on this issue. It is the global expression of a desire for serious and sustained action on climate change. Earth Hour began in Sydney in 2007, when 2.2 million homes and businesses switched off their lights for one hour. In 2008 the message had grown into a global sustainability movement, with 50 million people switching off their lights. Earth Hour is being taken to the next level, with the goal of 1 billion people switching off their lights as part of a global vote. Unlike any election in history, it is not about what country you are from, but instead, what planet you are from. View here a video clip on Earth Hour 2009. For more details, log on to Earth Hour.